Is there a natural tendency toward the political integration of states that are united in culture but divided in politics? Disjoined Partners arrives at a largely negative response. In an application of political science techniques to a subject traditionally in the domain of history, Peter J. Katzenstein analyzes Austro-German relations since 1815 in six chronologically arranged case studies. 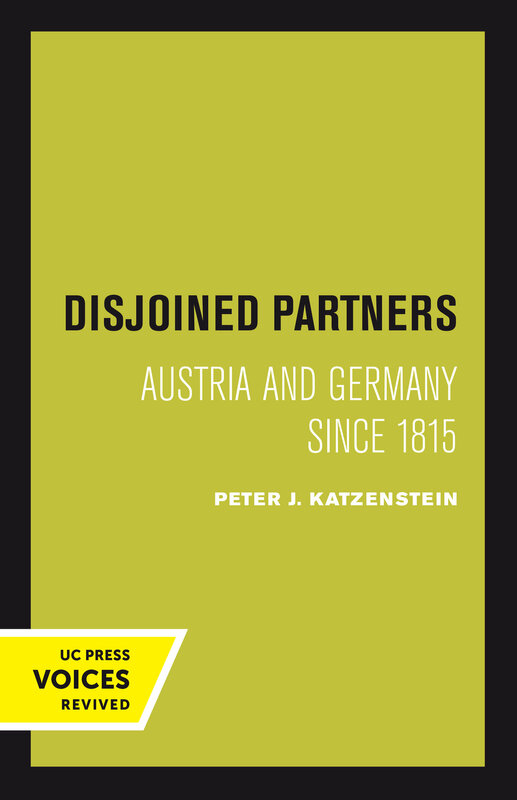 Asking why these partners remain disjoined, Katzenstein finds the answer in the persistence of Austria’s political autonomy. In an appendix, the author illustrates how this type of analysis could be extended to include an examination of the unification of Germany and of Italy in the middle of the nineteenth century and of the fragmentation of Sweden-Norway and England-Ireland at the beginning of the twentieth. His study sheds new light on the reasons for the continued political autonomy of nation-states. Disjoined Partners derives from the author's dissertation, which was awarded the Charles Sumner Prize at Harvard and the American Political Science Association’s Helen Dwight Reid Award for the best dissertation of the year in the field of international relations, law, and politics. This title is part of UC Press's Voices Revived program, which commemorates University of California Press’s mission to seek out and cultivate the brightest minds and give them voice, reach, and impact. Drawing on a backlist dating to 1893, Voices Revived makes high-quality, peer-reviewed scholarship accessible once again using print-on-demand technology. This title was originally published in 1976. Peter J. Katzenstein is the Walter S. Carpenter, Jr. Professor of International Studies at Cornell University.